Having vast experience in this field, we cater to the needs of our clients for corporate management. These services are designed to help improve management system of our clients to the present dynamics by introducing effective systems and procedures and implementing the same. Our services are undertaken by our talented professional, who have vast experience in their respective fields. Further, our services are known for their reliability, timeliness and cost effectiveness. M-6 Plaza" is high rise corporate building, laid out in 165000 sq ft. It is located in one of the up coming corporate sector in Jasola, New Delhi. It has got an enormous parking space, which is divided into three under ground parking levels. 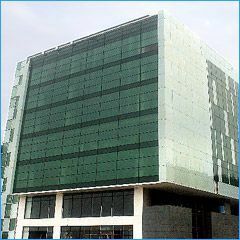 We serve this corporate building with complete gamut of operation ensuring complete satisfaction to our clients. We offer corporate management services & corporate security services for our these corporate buildings.